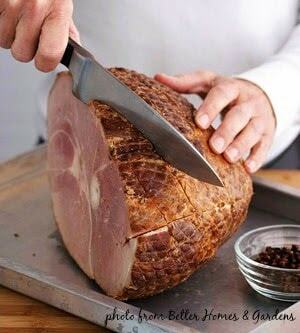 decorative touch to baked ham by scoring the top, then sometimes studding it with cloves. Another decorative way to serve ham is to score the ham first with a diamond pattern, cover the ham with pineapple slices and cherries. Scoring allows any glaze to penetrate the meat. 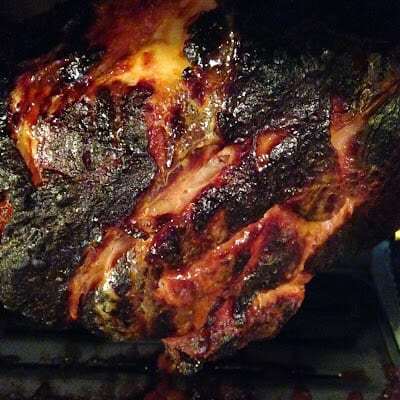 We prefer to make a ham using our Ronco Rotisserie that we have had for nearly 15 years. Years back, the Ronco Rotisserie was everywhere. You couldn’t turn on the TV without seeing a commercial or infa-commercial featuring the wonders of the Ronco Rotisserie…maybe you remember the slogan, “Set it and Forget it.” I don’t think there is a better method to cook a ham, than using a Ronco Rotisserie. *Maple Glaze is made with maple syrup, butter, corn syrup o.j. and allspice. The glaze is basted on the ham at intervals, forming a delicious, sweet crust/sauce that penetrates the ham beautifully. *Raisin Sauce is a yummy sauce to serve with ham. It combines light brown sugar, cornstarch to thicken the sauce, apple sauce, raisins, o.j., orange zest, vinegar and nutmeg to make an incredibly tasty sauce. Score the top of the ham into diamonds. Pace ham on the rotisserie. Set for 1 1/4 hours. In a small saucepan, combine the maple syrup, butter, corn syrup, 1 tablespoon orange juice, and 1/8 teaspoon allspice. Bring to a boil; remove the pan from the heat. Brush ham with some of the maple glaze. Cook for 15 minutes more, brushing once or twice more with the remaining glaze. Remove the ham from the rotisserie. Place on a large plate and cover with foil. Let stand for 15 minutes before craving. In a medium-size saucepan, combine the brown sugar, and cornstarch. Stir in apple juice, raisins, the 3 tablespoons orange juice, vinegar, orange rind, and 1/8 teaspoon allspice. Cook over moderate heat, stirring constantly, until the mixture starts to thicken. Cook and stir for 1 to 2 minutes more or until thickened. Serve sauce with the ham.